Today, it is World Art Day (WAD). And what better day to celebrate than the 564th birthday of Leonardo da Vinci. Why WAD? After all, we are surrounded by art and creative accomplishments on a daily basis. But to set aside a day for the whole world to participate, to party, to enjoy – that is an entirely different happening. It is collective resolve to become involved in the full measure of artistic expression. It is offering art to those we love. Art is a profound reflection of what we hold dear, symbolizing our values and belief systems. When we experience art, we enter the whole of human experience. Today, I want to offer a glimpse of this thought with art that celebrates the memory of Dr. Elizabeth Elliott, Associate Professor and Co-Director of the Centre for Restorative Justice at the School of Criminology, Simon Fraser University. I have never met Dr. Elizabeth Elliott, but I feel a connection through the creative endeavour that honours her memory. Let us continue to offer art to those we love. 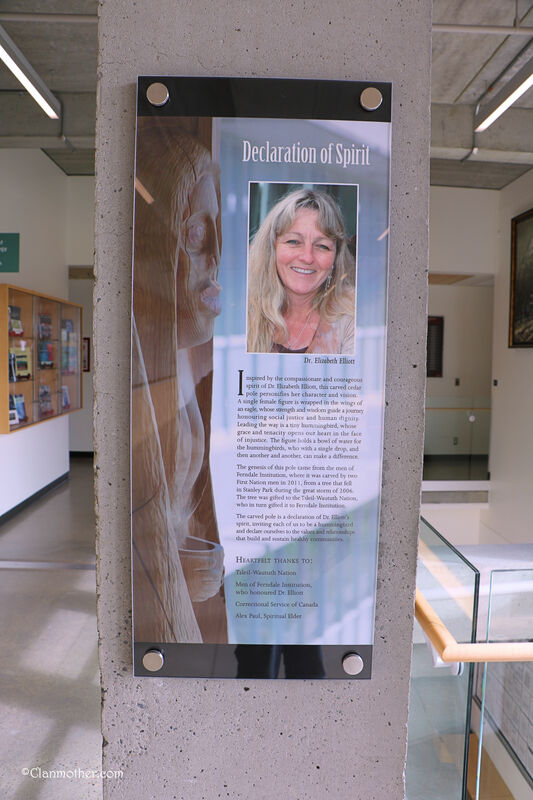 This entry was posted in LadyBudd, Simon Fraser University, Universities, World Art Day and tagged Declaration of Spirit, Dr. Elizabeth Elliott, Simon Fraser University, World Art Day. What a beautiful and telling work of art, this magnificent carving honouring the memory of Dr. Elliott. Telling as to the representation of this sculpture symbolizing its depiction of “A single female figure is wrapped in the wings of an eagle, whose strength and wisdom guide a journey honouring social justice and human dignity”, as expressed in the signage. What a marvellous choice to celebrate World Art Day! I am so glad that you share my excitement over this artwork. The creation was a labour of love. Your words from “If Life Should Be Forever…” come to mind. We will leave this existence, but the memory of our kindness, compassion and hope will remain in the thread of human experience. Such a beautiful and symbolic sculpture, Rebecca. A lovely tribute to a woman of compassion and dedication. I am just going through my Dad’s papers and photos that were especially meaningful to him. When I looked at this symbolic sculpture, I thought of Dad. We remember through “art.” We will experience loss, but it is the remembrance of what was, of who we loved that sustains and inspires. To me, blogging is a testament to our lives and allows us to relive and remember. Thank you for stopping by – always a joy to have you visit. This work of art, so very exquisite and well crafted, is so well chosen for the WAD. This totem pole is truly a compliment to the two First Nation gentlemen artists–so well crafted! And, an extraordinary compliment to the lady and to her work promoting social justice and human dignity. What better place for the totem pole to live than SFU on top of Burnaby Mountain?! It is a joy to meet Elizabeth Elliott by way of this blog. Thank you. I agree – this is an amazing way to celebrate the life of a woman dedicated to justice for all. I did not know Elizabeth Elliott, but the two artists did – and were able to speak about her spirit via art. And in doing so, they gave honour to those who share her values; and inspire those who come after her. Happy WAD. I had no idea. I love the idea of WAD! I was reading about Gertrude Stein and her salon; then I read about Gustave Klimt’s succession group. It seems that when we focus on art, interesting things happen. In our age of communication, the question is – how to focus when there is so much creativity around us. Thanks so much for stopping by – much appreciated. Wow, what an intriguing carving! 🙂 I remember my older brother teaching me at age 3 or 4 about totem poles from books we had, they seemed such a strange thing back in those days. I always admire people who can turn a large piece of a tree into something smooth and beautiful. It must be quite scary at times as I can imagine it might be difficult to amend a mistake. With a painting it can always be painted correctively over, but with carving….do they begin again? I have wondered the same thing! Bill Reid (Canadian artist known for his work involving Haida mythology) once said, “I have a sort of waking nightmare: to get this thing just about completed, and the last day to discover one little part that doesn’t quite fit with the adjacent part.” It seems that our pathways are never straight and our destinations remain unknown until they arrive.